Steelhead oarlocks are the light weight yet rugged oarlocks that are designed to make oars last longer because they are installed without drilling holes in the oars. Steelhead oarlocks clamp around the oars and can be easily adjusted to different positions to accommodate various width boats. 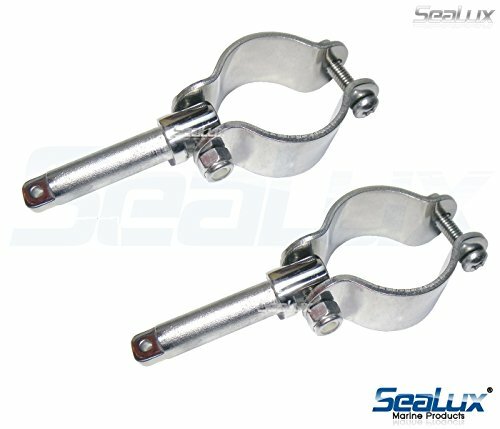 Steelhead oarlocks are made of Marine grade AISI 316 stainless steel construction and feature a unique channel design that provides extra strength to withstand years of rugged use. 1/2" straight shank 2 per pack. Feature Marine Grade 316 stainless steel construction that resists rust. The Clamp-On Oarlock fastens securely to the oar with one adjustable bolt with no drilling required. Easy-to-install oarlocks Replace worn-out oarlocks ;Inner Diameter: 1-3/8" to 1-3/4"; Shaft 1/2"